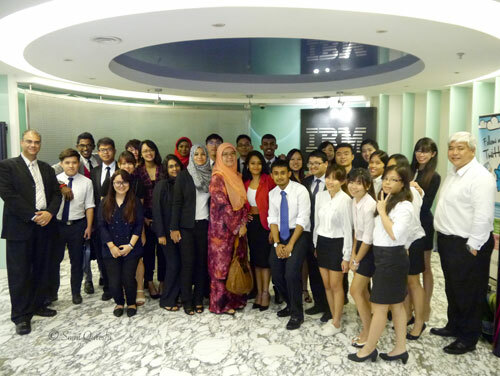 Through the project, INTI students were asked to develop a Public Relation strategy for IBM’s Shared Services, a connected enterprise that serves IBM’s business needs worldwide. “Through this collaboration, our students had to work on a real case and provide a valid solution, to one of the leading IT companies in the world. The students worked really hard on this project and the end product of their work is really impressive – we are extremely proud of them,” said a beaming Rohayu Kosmin, Senior Lecturer at INTI International College Subang. Around 30 INTI International College Subang Marketing students took part in the project, which ended with a final presentation to the representatives from IBM Malaysia. “This feels quite surreal to be honest; IBM Malaysia has always been one of my dream companies to work for and here we are, less than months to graduate and already presenting to them our ideas to improve some of their services,” said Gerard Peter, a final year Marketing student. “We were given the task of understanding the current Gen Y market trends and proposing specific enhancements to IBM Malaysia’s Shared Services. Judging by the feedback that we received, I believe we have impressed them, and this has given me tremendous confidence in my researching and presentation skills,” he added. Many initiatives are in place at INTI to help its students build competencies through innovative learning. INTI’s close ties with industry mean that its students have the opportunity to work on projects that may have actual and immediate impact on participating companies. These projects enable students to develop employability and competency skills, which include problem solving, communication, critical thinking and teamwork. “It is important to prepare students for employment and to ensure their knowledge and skills are current and relevant to industry needs. At INTI, we continually focus on engaging industry in our talent development initiatives and our students are exposed to the needs and demands of the industry at different levels of their academic journey,” said Jess Tinawin, Head of Career Services, INTI. Since 2011, INTI students have undertaken 350 innovative projects with 236 employers from various industries and over 96% of students getting employed within the first 6 months of graduating and 30% of students getting job placements even before graduation.